Lomont Molding LLC (Lomont) is one of the premier plastic molders in the country. Founded in 1982, Lomont operates 24 hours a day, 7 days a week. We take great pride in helping our customers create opportunities and finding solutions to their problems. 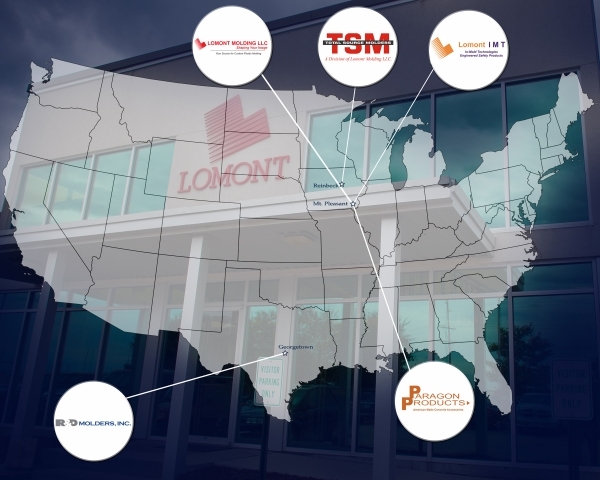 Lomont has over 350 dedicated employees who strive for constant innovation, quality management, and cutting edge technology. Lomont offers complete in-house Engineering and Design services, Tooling, Quality Assurance, In-Mold Technologies and Decorating, and Assembly and Secondary Operations. All of this is accomplished in either our state of the art 150k sq. ft. facility located in Mount Pleasant, IA, our 50k sq. ft. Reinbeck, IA facility, or in our 80k sq. ft. facility located in Georgetown, TX. Our manufacturing facilities offers molding capabilities ranging from 55 to 2,700 tons, processing numerous types of thermo-plastic resins. Lomont can manufacture parts ranging from a few ounces to 24 lbs. If we have “throw a ways” they are regrinded and put back in to our resin and reused. Our products contain recycled content.